SynAck ransomware uses sophisticated techniques to infiltrate computers and hide from its victims. Use Reimage to determine whether your system is infected and prevent the loss of your files. SynAck (also known as Syn Ack) ransomware is a crypto-virus that started attacking victims' computers in September 2017. Since then, four variants of this cyber infection appeared. 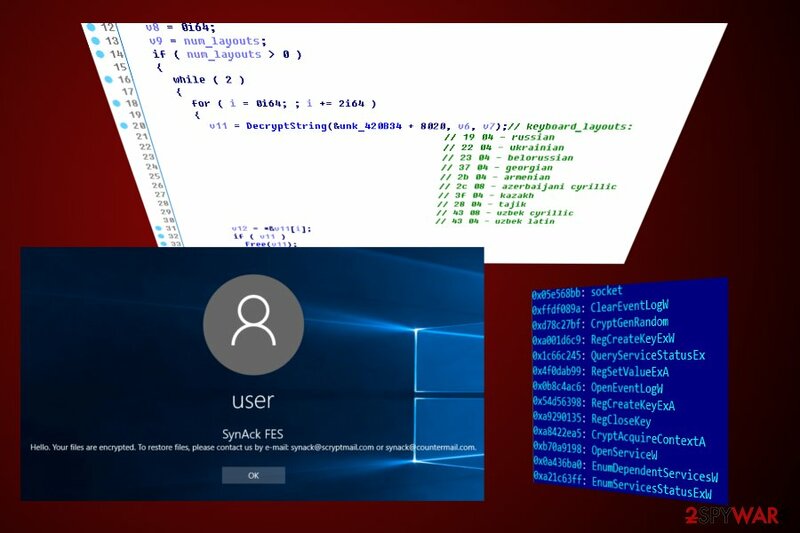 The latest version is quite significant in cybersecurity world, as it is the first ransomware to use Process Doppelgänging technique to infect PCs and evade security software detection. While this process is not completely new (it has been first presented in December 2017 at the BlackHat conference), it is, however, the first time it is used for a ransomware attack. Spam emails, unprotected RDP configuration, malicious downloads, etc. The purpose of the ransomware is the same as of many other viruses (such as Scarab, GandCrab 3, Dharma, etc.) – to encrypt files and demand ransom for data release. The virus drops a ransom note called RESTORE_INFO-[id].txt on the desktop to explain to users what to do to get files back. SynAck uses ECC-SECP192R1 & AES-ECB-256 encryption algorithms, which makes it impossible to decrypt files unless a unique decryption key is used (hackers store it on a remote server). 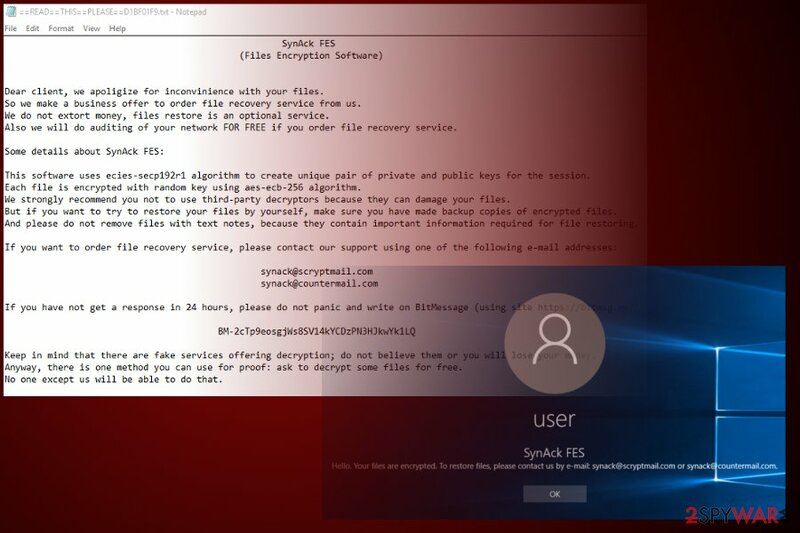 The latest version, SynAck FES asks victims to email synack@scryptmail.com or synack@countermail.com and offers to contact criminals via BM-2cTp9eosgjWs8SV14kYCDzPN3HJkwYk1LQ via BitMessage, in case there is no reply within 24 hours. According to victims’ reports, the SynAck developers can ask as much as $2100 in Bitcoin for data recovery service. Unfortunately, the wallet associated with the virus currently holds over 98 Bitcoins, which means that criminals have collected a lot of ransoms already. You shouldn’t pay them – this only motivates them to keep updating and improving their illegal operations. The virus doesn’t use the same extension to mark victim’s files – instead, it generates an individual set of ten random characters per file and appends it after the original file extension. 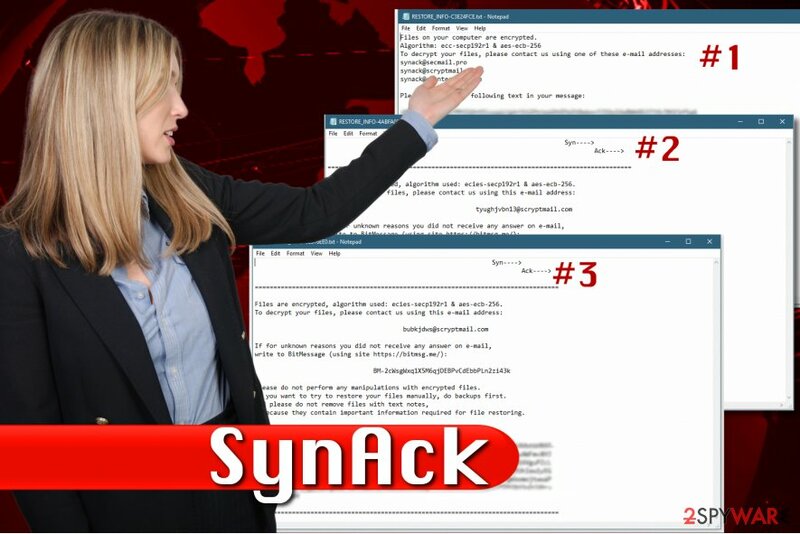 SynAck ransomware virus comes in three different versions. Each of them suggests writing to cybercriminals either via email or BitMessage. It is highly advisable to remove SynAck virus as soon as you notice its presence on your computer. Please remember that removing the virus won’t recover your files – you have to have a data backup in order to do it. However, programs like Reimage or Malwarebytes MalwarebytesCombo Cleaner can not only eliminate the ransomware but also restore corrupted Windows system files that may have been destructed during the cyber attack. We do not suggest trying to perform manual SynAck removal because the virus is simply too sophisticated to be deleted by inexperienced computer users. Besides, you must check whether the ransomware was the only virus that entered your computer, so a full computer scan is highly recommended. According to Kaspersky Lab, The newest version of SynAck uses an intricate technique (Process Doppelgänging) to avoid detection and analysis. This method allows the virus to use NTFS transactions to start a malignant process from the transacted file, making the malicious process look like a genuine one, as well as helping to avoid security software detection. The virus also prevents automatic sandbox analysts by checking the directory it executes from. SynAck will not proceed if it detects an attempt of launch from “wrong” directory, and exit the process instead. Hello. Your files are encrypted. To restore files, please contact us by e-mail: synack@scryptmail.com or synack@countermail.com. An interesting fact about this version of the virus is that it avoids targeting users from Russia, Belarus, Ukraine, Georgia, Tajikistan, Kazakhstan, and Uzbekistan. The malware consists of a hard-coded list of keyboard layouts, which allows it to compare it to the one present on the targeted PC. If one of the layouts matches SynAck's one, the virus simply stays idle for 300 seconds and then calls ExitProcess, avoiding file encryption. Ransomware actively targets users from United States, Kuwait, Germany, and Iran instead. SynAck ransomware seems to be distributed via RDP attacks. Criminals are trying to brute-force their way into victim’s computers or computer networks. This way, the virus can quickly compromise enterprise networks and demand huge ransoms for data recovery tools. On top of that, the malware might be distributed using other means such as malvertising, malicious spam, and similar techniques. The continuous movement of Bitcoins in the aforementioned Bitcoin wallet gives us a reason to believe that the malicious software might be provided as ransomware-as-a-service, meaning that any criminal can join the affiliate program and help to distribute the virus further. Keeping your anti-malware software up-to-date, creating a data backup and enabling automatic software updates is what can help you to prevent a ransomware attack. Do not forget to use powerful passwords on Remote Desktop Connection accounts, too. Experts report that the described ransomware strongly affected U.S., France, Belgium and Netherlands. It is highly advisable to use professional malware removal software to remove SynAck virus. It is not a typical computer program, and you can’t uninstall it via Control Panel using its uninstaller. To perform a successful SynAck removal, employ a software like Reimage or Plumbytes Anti-MalwareMalwarebytes Malwarebytes. You might need to restart your PC in a particular mode if the security software fails to start in the normal regime (it means that the malware is trying to block your attempts to identify and remove the virus). Prepare your PC for SynAck removal – reboot it into Safe Mode with Networking. Once the computer is ready, run your anti-spyware or anti-malware program to detect and eliminate malicious files. Log in to your infected account and start the browser. Download Reimage or other legitimate anti-spyware program. Update it before a full system scan and remove malicious files that belong to your ransomware and complete SynAck removal. When a new window shows up, click Next and select your restore point that is prior the infiltration of SynAck. After doing that, click Next. Once you restore your system to a previous date, download and scan your computer with Reimage and make sure that SynAck removal is performed successfully. Guide which is presented above is supposed to help you remove SynAck from your computer. To recover your encrypted files, we recommend using a detailed guide prepared by 2-spyware.com security experts. One of the most efficient data recovery tools available today is Data Recovery Pro. You might want to try it and see if it manages to recover some files encrypted by SynAck. ^ Anthony Cuthbertson. Ransomware Attacks Rise 250 Percent In 2017, Hitting U.S. Hardest. Newsweek. News, Analysis, Politics, Business, Technology. ^ Anton Ivanov, Fedor Sinitsyn, Orkhan Mamedov. SynAck targeted ransomware uses the Doppelgänging technique. Kaspersky Lab. Security researchers. ^ ZonderVirus. ZonderVirus. Malware and Security News. This entry was posted on 2018-05-08 at 02:33 and is filed under Ransomware, Viruses. You can quickly scan the QR code with your mobile device and have SynAck ransomware virus manual removal instructions right in your pocket. How did you remove SynAck virus?